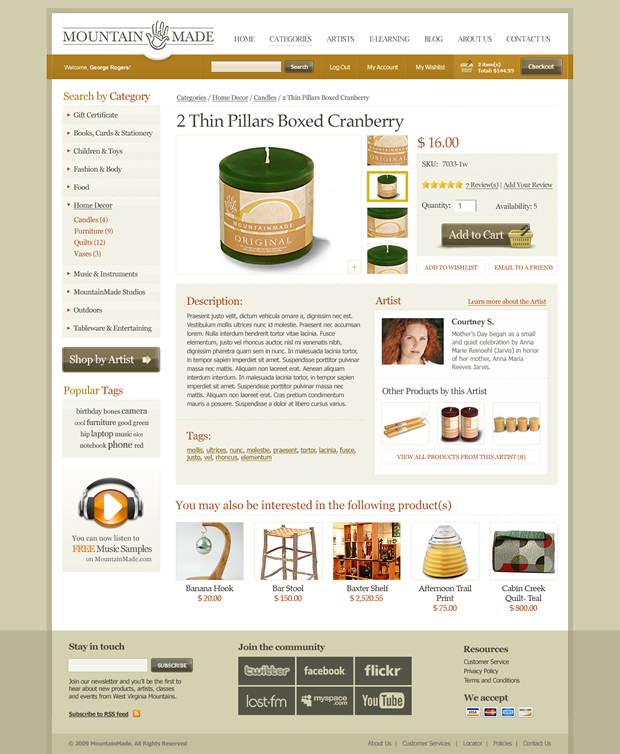 We are very proud to announce that we were working on one great online store in the last couple of weeks. We wish you welcome to the web marketplace of West Virginia’s finest handmade art: Mountain Made. Its online gallery and storefront brings you the highest quality crafts and creations made in the Applachian tradition. You’ll find artists working in just about every medium imaginable, as well as musicians. Be sure to check out our courses and studios, too. The site is developed with the Weld team who has direct contact with the actual client. First (Magento) phase of the project is completed where the goal was to launch an online store with unique design and standard online store functionality. However, the project is not yet complete. We are working on boosting the community goals of the site, especially the interaction between visitors and artists. So, it the next few weeks you will notice how this website grows from classic online store to the interactive web portal that connects craftsmen from West Virginia mountains with the world.